Proteins represent the structural composition of all living organisms. All living organisms, from the biggest animal to the most microscopic organisms, are mainly made up of proteins. Proteins contribute to the biochemical processes that preserve life. Proteins are complex macromolecules (polymers). They have high molecular weight and are made up of structural units (monomers) called amino acids. Amino acids are the protein’s building units. They are organic compounds made up of hydrogen, oxygen, carbon and nitrogen atoms. Amino acids are made up of a basic group (amino group NH2), an acidic group (carboxyl group COOH), a hydrogen atom, and a terminal group R which differs from one amino acid to another. Proteins are made up of repeated units of amino acids which link with each other via peptide bonds. Take a look figure 15: you can observe that these bonds are present between the carboxyl group of an amino acid with an amino group of another amino acid, with the removal of water. The combination of two amino acids is called a dipeptide compound, and the protein chain formed of several amino acids is called a polypeptide. When protein is being formed, it is not conditional for the combination to occur among similar amino acids. Therefore this gives us many varying ways to form proteins, depending on the types, order, and number of amino acids in the chain. About 20 amino acids participate in building the proteins such as glycine, alanine, and valine. This describes the arrangement of amino acids in polypeptides of a certain protein. This level determines the number, kind and arrangement of the amino acids forming a protein. Amino acids, as their name indicates, contain both a basic amino group and an acidic carboxyl group. This di-functionality allows the individual amino acids to join together in long chains by forming peptide bonds: amide bonds between the -NH2 of one amino acid and the -COOH of another. Sequences with fewer than 50 amino acids are generally referred to as peptides, while the terms protein or polypeptide are used for longer sequences. A protein can be made up of one or more polypeptide molecules. The end of the peptide or protein sequence with a free carboxyl group is called the carboxy-terminus or C-terminus. The terms amino-terminus or N-terminus describe the end of the sequence with a free α-amino group. This describes the way by which polypeptides are coiled. This structure is formed as a result of the hydrogen bonds between carboxyl and amine groups in close amino acid monomers. The two main types of secondary structure are the α-helix and the ß-sheet. 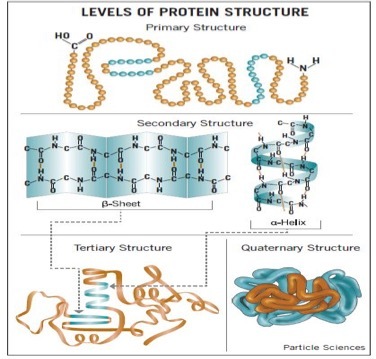 This describes the three-dimensional shape of proteins. This structure is formed as a result of the bonds between the side groups (R groups) of amino acids, which bend the different polypeptide chains and give protein its unique shape. The overall three-dimensional shape of an entire protein molecule is the tertiary structure. The protein molecule will bend and twist in such a way so to achieve maximum stability or the lowest energy state. Although the three-dimensional shape of a protein may seem irregular and random, it is fashioned by many stabilizing forces due to bonding interactions between the side-chain groups of the amino acids. This describes proteins which consist of two or more chains of polypeptides. This structure is formed as a result of the linkage of polypeptide chains with each other. Many proteins are made up of multiple polypeptide chains, often referred to as protein subunits. These subunits may be the same (as in a homodimer) or different (as in a heterodimer). The quaternary structure refers to how these protein subunits interact with each other and arrange themselves to form a larger aggregate protein complex. The final shape of the protein complex is once again stabilized by various interactions, including hydrogen bonding, disulfide-bridges and salt bridges. Proteins are very sensitive molecules. The term ‘native state’ is used to describe the protein in its most stable natural conformation, in situ. This native state can be disrupted by a number of external stress factors, including temperature, pH, removal of water, the presence of hydrophobic surfaces, the presence of metal ions and high shear. The loss of a secondary, tertiary or quaternary structure due to exposure to stress is called denaturation. Denaturation results in the unfolding of the protein into a random or misfolded shape. A denatured protein can have quite a different activity profile than the protein in its native form, and it usually loses its biological function. In addition to becoming denatured, proteins can also form aggregates under certain stress conditions. Aggregates are often produced during the manufacturing process and are typically undesirable, largely due to the possibility of them causing adverse immune responses when administered.